Ben enlisted on May 1, 1864 as a second Lieutenant of Company C , 139th, Illinois Volunteer Infantry he was honorably discharged on October 28, 1864. He reinlisted on February 10,1865 and was mustered in as Captain of Company C, 148th Illinois Volunteer Infantry. He was discharged on September 5, 1865 at Nashville, Tennessee. Mr. Burnett received letters of thanks from President Lincoln and the Secretary of War Stanton. 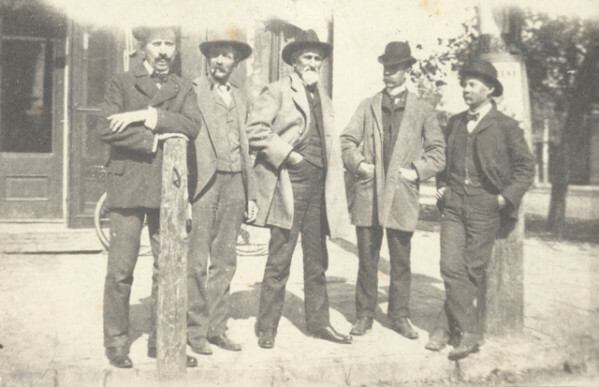 In 1879 Ben and his family moved to Fort Collins. He was instrumental in the founding of LuLu City, Pearl, Manhattan, Teller and other mining communities in Northern Colorado and Southern Wyoming. He invested in mines, but mainly provided supplies to the miners who worked the different mine districts which he promoted. Ben and Clara had six children: LuLu, Frank, Pearl, Arthur, Maud and Zoa. He and his family annually spent their summers in their tree embowed cottage "Laughalot" on the banks of the swift flowing Cache La Poudre river. 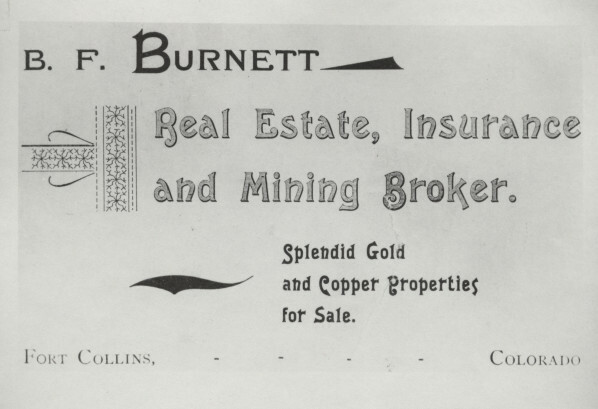 Some of the information about B.F. Burnett I covered on my page LuLu City. Captain Benjamin Burnett passed away on Wednesday May 15, 1922 in San Diego California. Mr. and Mrs. Burnett spent the winter in a milder climate. Both became ill at the same time, and despite the best medical skill and care both passed on. The location of this photo is not known, however I think it might be near their cabin on the Poudre, Laugh-a-lot.. This building was originally a hotel in the mining town of Manhattan Colorado.